Learning is an ongoing life long process. No matter how deep we are into our specific field there is always the opportunity to learn new skills and pickup new tips. When your running a business full time however it can be hard to find time to dedicate to education. This is especially true in the field of aerial imaging, where technology changes so fast and many of us come from non related fields, there can be a lot of new skills to learn from flying the drone, through to editing the imagery, and marketing our services. We recently wrote about CreativeLive as a learning resource on our sister website blog over at schooner labs as a great online source for education for those with limited time. 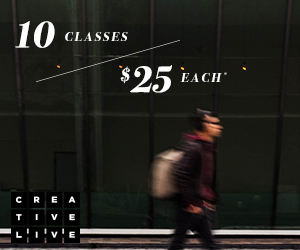 CreativeLive uses a freemium pricing model, the classes are free to live stream or can be purchased to watch at a later date if they don’t match your immediate schedule. Photographer Chase Jarvis and entrepreneur Craig Swanson in Seattle in 2010, they leverage their background to bring a wide range of industry experts as instructors for their courses, giving the viewer some of the best in breed real world experience across the topic areas. In terms of aerial imaging, CreativeLive offers a number of courses that directly apply to day to day needs around photo editing & video production. There are also a number of aerial & drone specific courses in the available library. In addition they also carry courses on managing your business and getting the most out of social media promotion and branding and related topics. So when you have some free time between UAV operations, have a look at CreativeLive to see if there may be a chance to learn some new skills you can apply to your aerial imaging business to help move things to the next level. Note – We are a CreativeLive affiliate and the links provided do provide us a small amount of funding if you purchase any of their offerings. As with everything we share we only recommend items we truly believe in and have used. Like you we are just a small business and making every penny count is key in the quickly changing aerial industry. This year the big item of many wish lists is a UAV or drone. We will no doubt see a lot of these under the trees come Christmas morning. Drones offer are a fabulous means to have a new outdoor recreational experience that can bring any number of educational opportunities such as understanding how a drone works, from aerodynamics, control systems, & communications through to a new ways to shoot photos & video, and even drone racing… The sky is the limit. But while these are very cool pieces of technology there are a few things owners should know to operate them safely and legally within Canada. For starters be sure to fully read all the documentation that comes with your drone. Don’t rush out first thing to get it in the air. You could easily lose your shiny new toy if not properly configured or worse yet cause an accident. Be sure to note the battery safety instructions as well, most of these aircraft use Lithium Polymer batteries, which can be very dangerous if damaged or charged incorrectly. One factor that may get forgotten in the rush to do an aerial job is the effect of the weather on your drone, more specifically the air temperature on a multicopter’s performance. Most know of the impact temperature has on LIPO batteries, but the impact extends beyond just this. Most pilots are aware of the effect altitude has on the performance of the power system and props, the higher you are the less thrust gets produced due to the thinner air density. The same effect also happens with increased ambient temperature. As the air temp increases the air density drops and in turn so does thrust. Humidity also impacts this effect as well. Generally, thrust decreases with an increase in ambient temperature. Density altitude is the altitude relative to the standard atmosphere conditions (ISA) at which the air density would be equal to the indicated air density at the place of observation. In other words, density altitude is air density given as a height above mean sea level. “Density altitude” can also be considered to be the pressure altitude adjusted for non-standard temperature. When operating in hotter conditions be aware of the effect and make sure your system has adequate thrust and performance to overcome the conditions.